Fire service proposals to meet a multi-million pound financial shortfall by reducing the number of firefighters on a fire engine from five to four will be considered by its governing Authority. South Yorkshire Fire & Rescue says the only alternative to making the change- which has already been adopted by many other services nationwide- is to reduce the speed of its 999 response during the night time period from up to half of its fire stations. The organisation faces cost pressures of up to £4 million, due to no longer being able to use a way of staffing fire stations called Close Proximity Crewing which and because it may have to meet a significant, national shortfall in pension contributions. Deputy Chief Fire Officer Alex Johnson, said: “We’d rather not make any changes at all, but have a duty to match our resources to local risk and to manage the service in a financially responsible way. All fire and rescue authorities must provide a plan which sets out the steps they will take and resources they need to improve public safety, reduce fires and save lives. This is known as an Integrated Risk Management Plan (IRMP). It must be publicly available, reflect consultation with stakeholders and demonstrate the most up-to-date analysis of local risk. South Yorkshire Fire & Rescue’s draft IRMP will be considered by Fire Authority members at its meeting on Monday 8 April. If approved, the plans will then be consulted on with members of the public. How safe are your older relatives? For our latest campaign we’re asking people to find the time to visit the older people in their lives and go through our Grandparent Check, which asks a series of questions including whether they live alone, smoke, need a walking aid and use emollient creams. 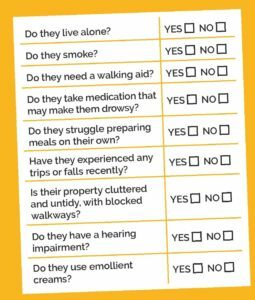 Our statistics show that fire risk can increase with age and, if you answer yes to any of the questions above in relation to an older friend, neighbour or relative, they may be at higher risk and be eligible for a free home safety check by our staff. 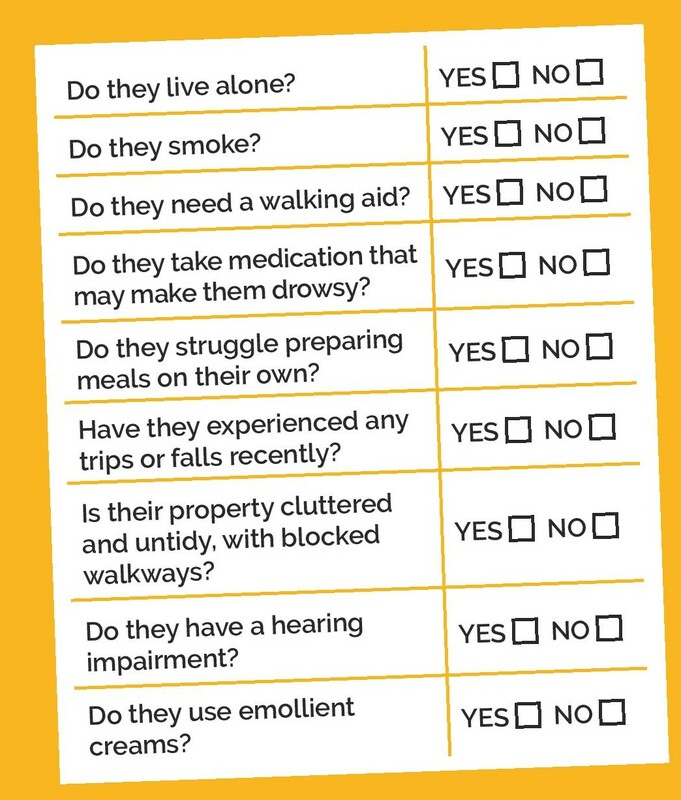 Check today by filling out our home safety check referral form, below. The form below collects some personal information, which we will only use for the purposes described. You can find out more about how we collect and store personal information here. If you’re filling this form for someone else please ensure you enter their details on their behalf. Ensure that the contact number provided can be used to organise a visit. To continue to reduce house fires, deaths and injuries we believe we need to become even more targeted in the way we deliver our safety work.To achieve this, we have changed our Home Safety Check service so that safety advice continues to be given to tall, but home visits by fire service staff are only offered for free to those most at risk of fire.Please answer some questions below to help us determine your likely risk of fire. We would like to contact you from time to time about our latest safety campaigns or to remind you to test your smoke alarms. If you are happy for us to contact you, please select all methods that apply. Anyone can be anything – that’s the message in a new heart-warming film from South Yorkshire Fire & Rescue (SYFR) today, Friday 8 March. Produced in celebration of International Women’s Day, the video shows what happened when three female fire service staff spent a morning with year three schoolchildren. The kids were asked what they would like to be when they grow up, and were asked to guess what jobs their guests did, before being shocked and inspired when they found out their real occupations. Filmed at Mosborough Primary School, in Sheffield, the aim of the video is to highlight the range of career options within the fire and rescue service – and encourage local women to register their interest in careers with SYFR. Deputy Chief Fire Officer, Alex Johnson, said that the film is part of a wider effort to change perceptions around the fire service being a male dominated organisation. “We’ve come a long way in recent years but there’s still more to do – you only have to look at the fact I’m one of only four women in the country who hold such a similar senior position, and the figure that still only five per cent of firefighters are women, to see that,” she added. “For so long the image of the fire service that is portrayed in films and the media is of men rushing into burning buildings, but the actual reality is so far from that. We do much more community and youth engagement work now where we need a variety of skills and people that are representative of South Yorkshire’s population. “Of course our staff do go into burning buildings but this isn’t just men, we have both male and female firefighters who go through the same rigorous testing and training process to be able to ride on one of our fire engines. The video, which has been unveiled this morning, stars Bronte Jones, a firefighter at Rotherham fire station, Sharon ‘Shaz’ Bailey, a Maintenance Operative & Driver and Amanpreet Kaur, an ICT Applications Developer. Bronte, who graduated from her training course in December last year, is a former Mosborough Primary School pupil. She said: “My dad works in the fire service so I’ve grown up in the fire family. I’ve wanted to be a firefighter for as long as I can remember so passing my training course at the end of the year was a dream come true. Afterwards I just thought wow, I’ve actually done it! “There’s a lot of common misconceptions around firefighting but, man or woman, you only pass the training course – which is tough and physically demanding – if you are fit and strong enough to do the job properly. “Of course there are times when it gets hard but, like I said to the kids at school, if you fully commit to it, work hard and maintain your standards, then you can do it – regardless of your gender. Personally I think it is the best job in the world, it’s so rewarding. Anybody interested in a career with South Yorkshire Fire & Rescue can register their interest, to receive future job notifications, at www.syfire.gov.uk/find-a-job/register-your-interest/. South Yorkshire Fire & Rescue’s training and development centre is currently playing host to the biggest group of firefighter recruits in the organisation’s recent history. The 17 trainee firefighters, who are currently on an intense 13-week long course, are now half way through their fourth week. So far they’ve had a packed agenda that has included fitness tests, advanced first aid training and an introduction to standard firefighting equipment, such as hoses, ladders and pumps. And the hard work has continued this week, with their current theme being road traffic collisions and vehicle rescue techniques. Normally courses at the service’s Handsworth-based training facility only cater for 12 trainees at a time, however a combination of high levels of interest and good quality candidates has led to a larger group this time. Once these 17 trainees finish their course they will be sent out onto stations across South Yorkshire as firefighters in development. “It has been great to introduce these new trainees into our organisation over the last few weeks for the start of what we hope will be long and rewarding careers with us,” said Area Manager Andy Strelczenie, head of emergency response. “Ahead of them lies two rigorous and challenging months as they work through various modules – including working at height, casualty handling, breathing apparatus and live fire training. “They will also be doing a week’s worth of fire prevention activity within their local communities which, of course, is a really big part of a modern day firefighter’s role. A man from Sheffield has been commended by South Yorkshire’s Chief Fire Officer for helping to save a woman’s life last year, after she became trapped in a river. Cole Johnson was walking across a bridge near Broadfield Road with his girlfriend, at around 8.30pm on Thursday 12 July, when he noticed a body in the water below. On closer inspection he realised it was a woman – who was stuck with potentially serious head injuries – and immediately entered the water to help. He used his jacket to stem the bleeding from her head, ensured she stayed still to prevent any spinal injuries and stayed with her, offering reassurance and support, until emergency services arrived. “What Mr Johnson did, in selflessly getting into the river to help, was clearly a heroic act. He potentially saved a life,” said Assistant Chief Fire Officer, Tony Carlin. “Even in summer open bodies of water are much colder than they look, yet he still got in there and spent at least 30 minutes supporting this woman. In recognition of his actions, Cole will be awarded the highest level of recognition and thanks available from a fire and rescue service – a Chief Fire Officer’s commendation – that will be presented at a ceremony tomorrow at Rivelin Fire Station. This award goes to people who have demonstrated meritorious conduct – putting themselves at some sort of risk to save a life in a hazardous situation. “It was a nice summers evening and we’d just been in the park when I saw what looked like a body in the river,” said Cole reflecting on the incident, over eight months on. “As I climbed down the river bank to get a closer look I realised it was a woman stuck, then something just switched in me. I just wanted to make sure she was OK so I got in and used my jacket to stop the bleeding from her head wound. “I didn’t really want to move her out of the water as I didn’t know whether she’d got spinal injuries, so I just kept her still and spoke to her until help arrived.